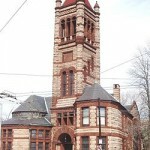 The new-yet-old Richardsonian Romanesque style of Boston’s Trinity Church launched a tsunami of imitation in courthouses, post offices, prisons, libraries, department stores, and churches across the land. 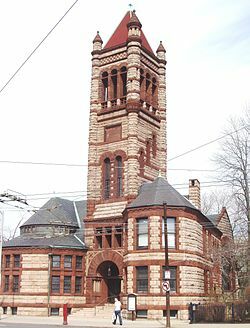 Architects Cutter and Bishop of Worcester understood what Richardson was about better than many, completing Harvard-Epworth in 1893. Its original amphitheater-style seating plan was shifted ninety degrees in the 1940s, when a suspended ceiling was also committed, the latter lingering until the 1990s. Much fine original woodwork remains to be admired.